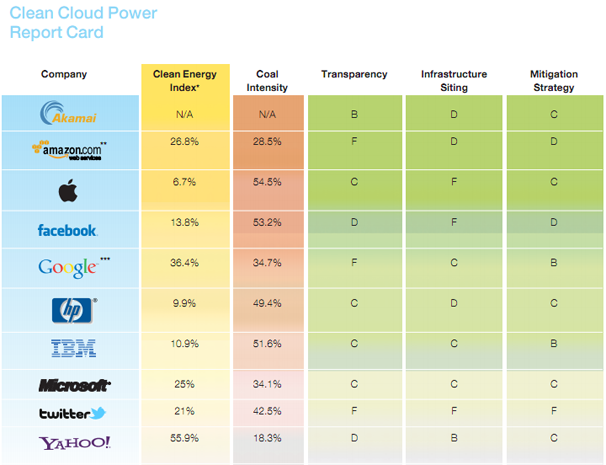 Whose Cloud is Dirtiest -- Google's, Microsoft's, Facebook's, or Apple's? Apple has long prided itself on the environmental consciousness behind its products, and consistently aims to get greener. But according to Greenpeace's report [PDF] measuring the amount and type of energy consumed by top tech companies' data centers, Apple is doing a poor job with its energy consumption. The report, "How Dirty is Your Data? ", compared Apple to other top tech companies such as Amazon's Web Services, Facebook, Google, HP, Microsoft, Twitter, and Yahoo. Apple scored the lowest--6.7 percent--in its overall Clean Energy Index, while Yahoo scored the highest, with 55.9 percent. Apple was also the worst offender in terms of coal intensity, scoring 54.5 percent, with Facebook trailing closely behind with 53.2 percent. Accepting the brunt of the blame is Apple's 500,000-square-foot facility coming online in Maiden, North Carolina--a facility that, according to Greenpeace, will consume as much energy as 80,000 U.S. homes. Greenpeace does give props for Apple's transparency about the environmental footprint of its hardware--such as MacBooks and iPhones--it received a C-grade for transparency when it comes to the current or expected impacts of its online products. Apple also got an F-grade for environmental awareness of its siting, meaning that North Carolina facility--the same one that will stream iTunes to your iOS device soon--is smack dab in the middle of what Greenpeace calls the "dirty data triangle." Google and Facebook also have facilities on that grid, which is made up of only about 5 percent clean energy, with the rest coming from either coal (62 percent) or nuclear (32 percent). Greenpeace's report wasn't all condemnation, though. The organization did say, essentially, that Apple was "getting better." Plus the data collected for the report didn't come directly from the companies under scrutiny, as there is no law in the U.S. requiring that. The report drew publicly available information on "recent investments of select brands and current clean energy supply associated with each investment," and from there, matched that information with data from the government or utilities. Still, nobody likes getting an F.